At the beginning of 2018, I wrote about the de-bugging of Buzz, our Langstroth beehive who met its end late last summer. Buzz lost its queen in spring of 2017 (who knows what happened?) and we were never able to successfully requeen the hive (we tried, we really tried!). The hive declined because there was no mated queen replenishing the population of workers and once the hive reached a weak enough tipping point, it was invaded by wax moths. I cleaned Buzz in winter and in mid-April, two weeks before we left for a trip, we rehived our beloved Buzz. A package of honeybees await release from their traveling cage. I wonder if they’re staring at their new home? It’s a good idea to feed newly hived honeybees for the first month or so. The feed is a 1:1 sugar/water mixture and helps the girls establish a solid beginning in their new home. 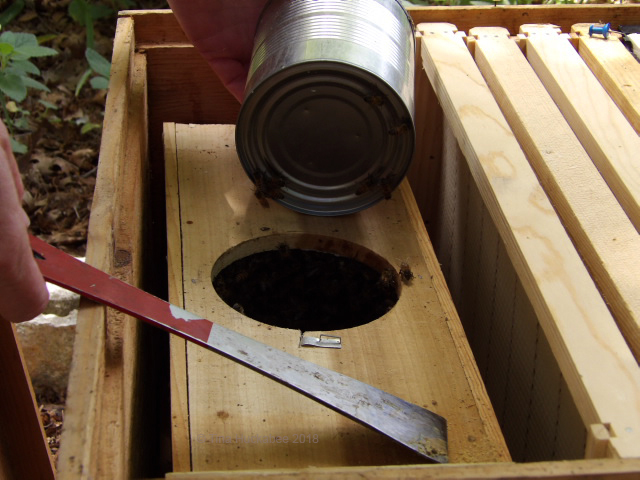 When we feed our bees (with a new hive, during a severe drought, or at the end of winter, before much is blooming) we use boardman feeders which are placed outside the hive, on the entrance board. Buzz doesn’t need much sugar-water now, but I’m still supplementing a bit using a boardman feeder. 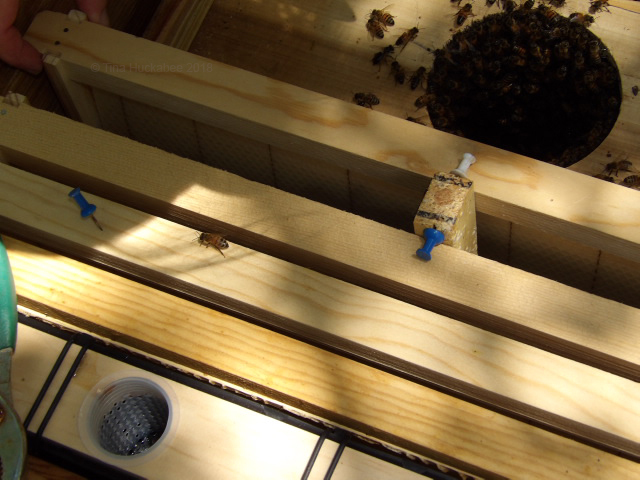 She has made such progress in comb-building, egg laying, and honey production, that we’ve recently added a second box. Go Buzz! Our trip was couple of weeks long and we didn’t think that asking pet/house sitters to change the bees’ sugar water would be met with much enthusiasm. It’s one thing to ask folks to care for cats and even an elderly dog, but honeybees? The ones who sting when they’re annoyed? That’s a whole different ball of wax. Instead, we opted to purchase an internal feeder which holds about two gallons of sugar-water. 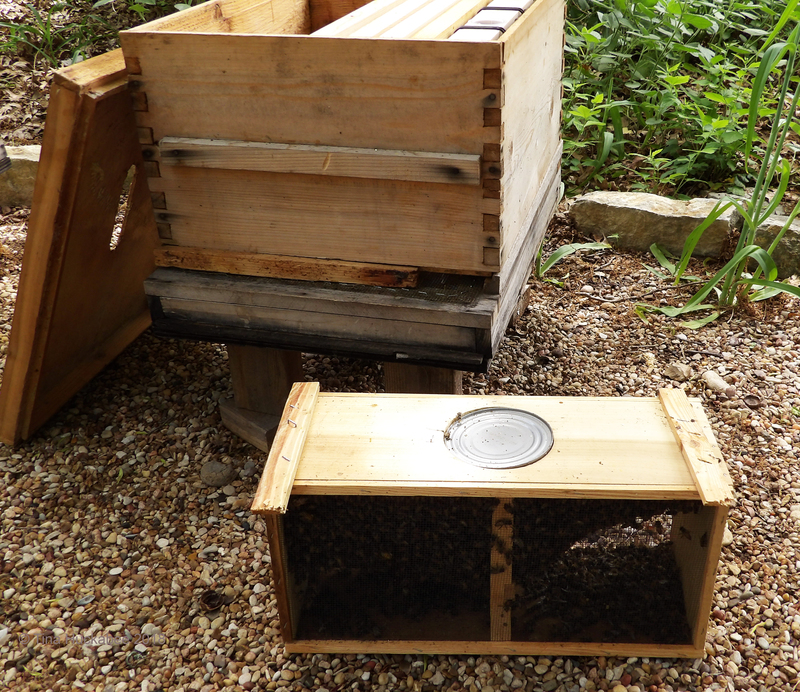 We’ve liked the boardman feeders and they work fine when we’re around, but the internal feeder holds significantly more liquid and that’s perfect for when the beekeepers are out-of-town. The feeder holds a deceptively large amount of fluid. The openings are feeding tubes. You can see the top of the sugar-water. 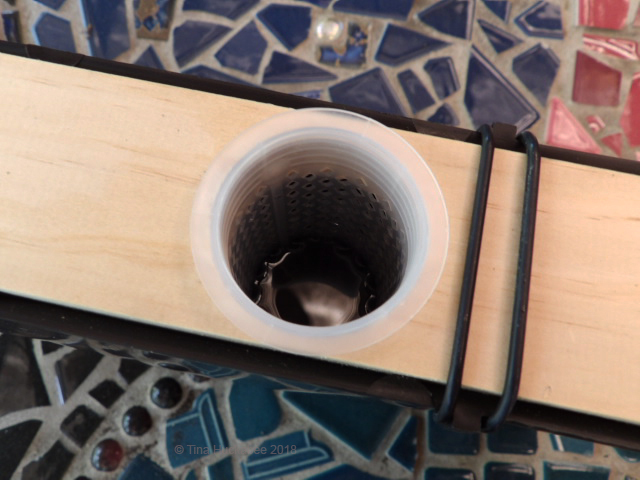 The feeder tubes are plastic, with tiny holes along the sides. Bees hold on to the sides and drink, drink away. Before we left home, our industrious bees imbibed two full rounds of sugar-water feed and I filled the box with two more gallons of the stuff the morning we left. 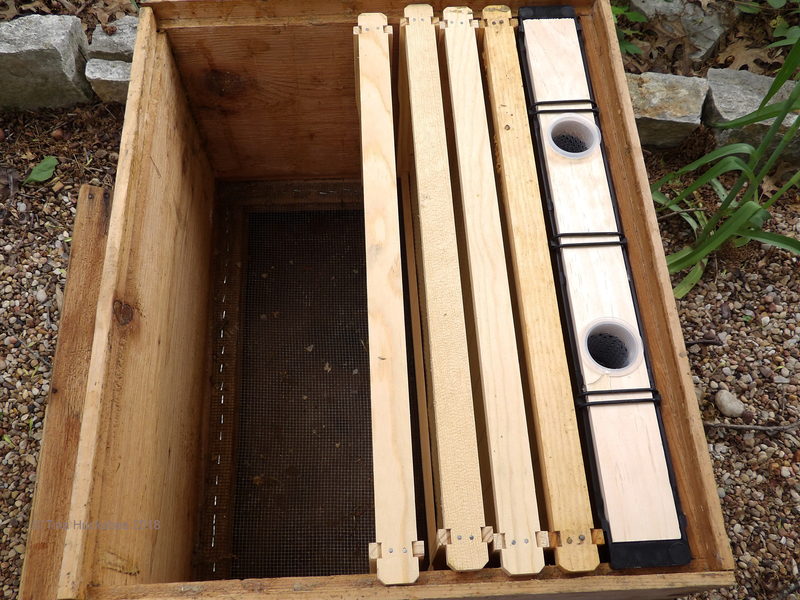 …and for the box of eager, beaver honeybees. …and the bees were ready for their new digs. I dare you to stick you hand in there! Actually, I did. I needed to manuever the queen cage out of the hole, so an ungloved hand is the best tool for that job. The girls were very nice. They don’t become cranky until they have larvae and honey to protect. 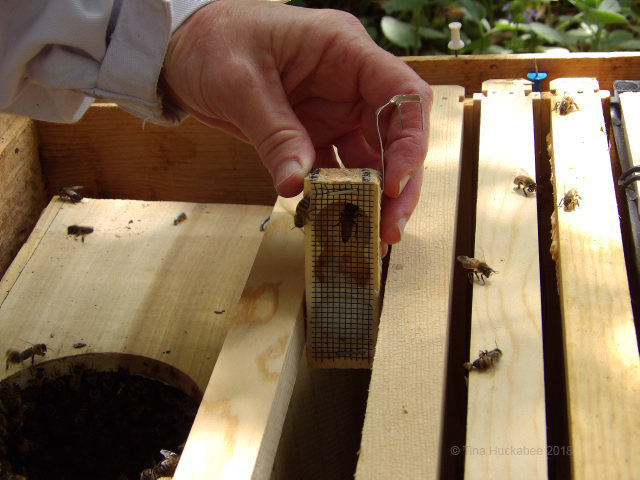 The queen cage is affixed to the top of the bee box. The queen is sequestered in the little cage, but her workers have access to her and her pheromones. They adore their Dear Leader. Queen honeybees have longer abdomens than worker bees. They have to store those eggs somewhere! I hung the queen cage between two frames. She must eat through the sugar fondant (the white end of the cage, above), in order to exit the cage, meet her subjects, and get going on her only job: to lay eggs–and lots of ’em. 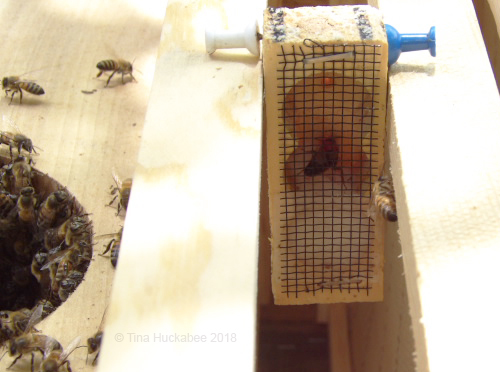 Settled in: frames, honeybees, queen, and sugar water feeder. All good! After rehiving, we covered the box and high-fived one another on the newest Buzz! 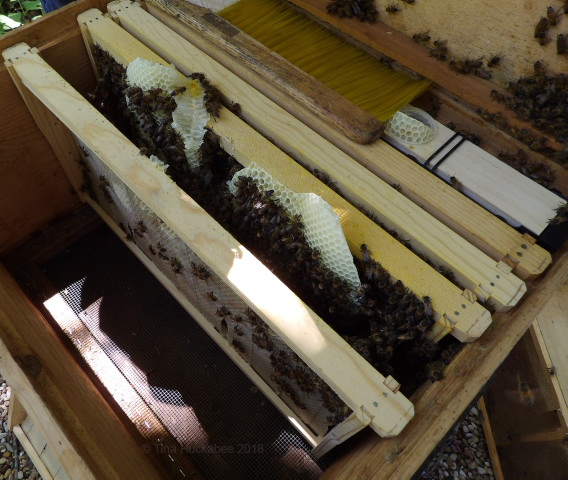 A week later we checked Buzz; the queen was out, some comb was built and the bees were off to a good start. At that point, we removed the traveling box and added the other frames. 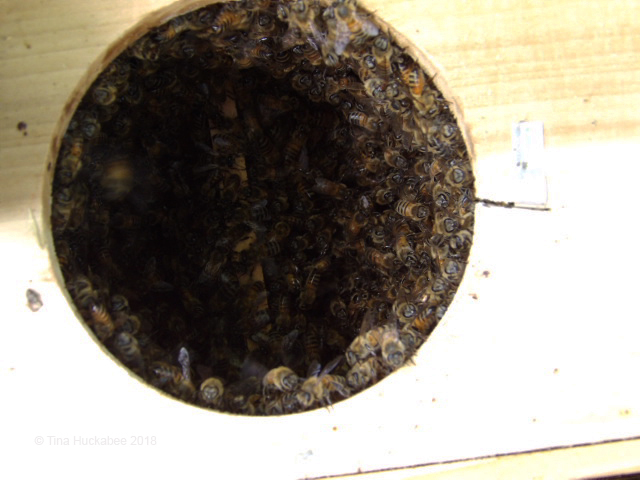 While doing our bee thing with Buzz, we opened Woody for a quick look-see and found that she had honeycomb, but also lots of cross-comb in her top box. Because it’s messy and difficult to deal with, we scraped off the cross-comb. Since then (mid-April) we’ve checked Woody and have noticed the same issue: comb placed inappropriately. 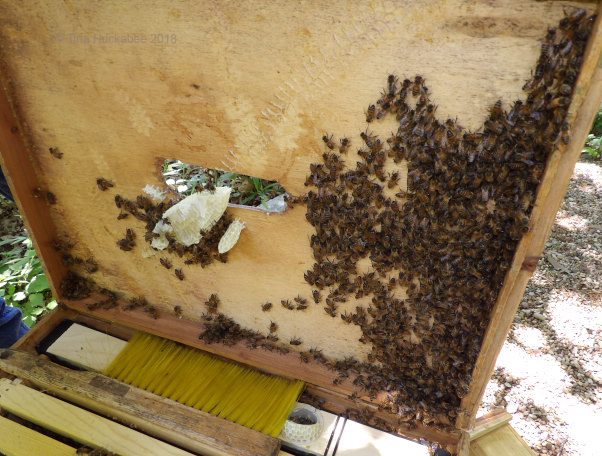 To clarify, it’s really an issue for the keeper; cross-comb is perfectly fine for the bees, they don’t care where or how they build honeycomb, they’re just driven to do so. We’ve since figured out why they were building cross-comb, but more about that later. 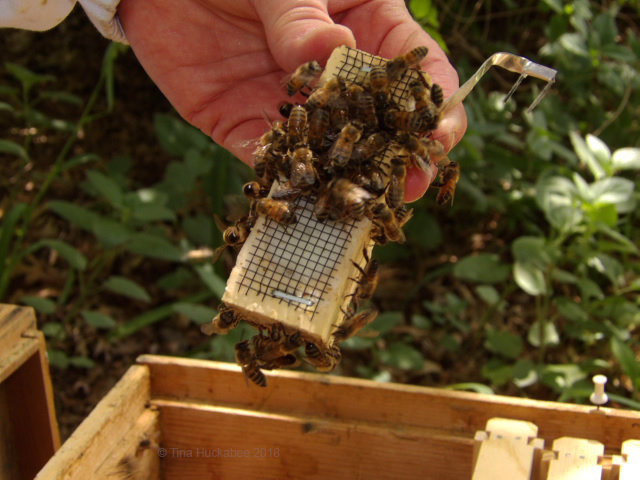 There’s always something new to learn–or be reminded about–with honeybees! Their comb-building might be wonky, but the egg-laying is perfect! Look at all these baby bees: snuggled in their cells, just waiting to grow-up and be bees. 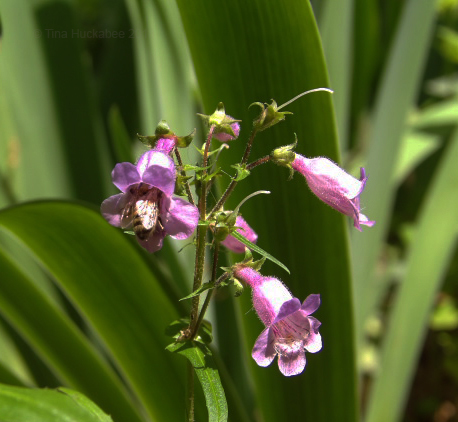 Honeybee nose-deep in a Gulf coast penstemon (Penstemon tenuis) bloom. 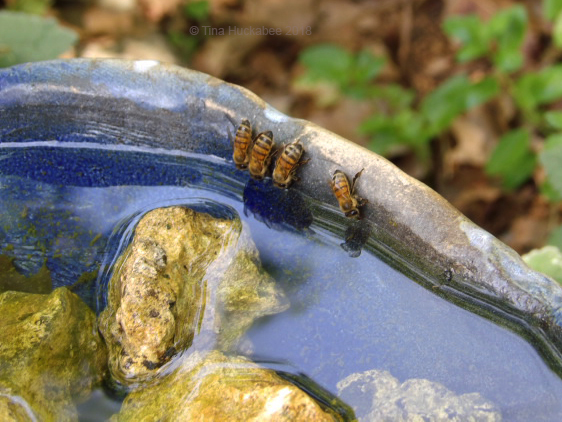 …and sip water from bird baths or ponds so that honeycomb is made and their homes are successful. What a fascinating post. I kept a beehive for a while, but found I wasn’t as brave about tending to it as I thought I would be. 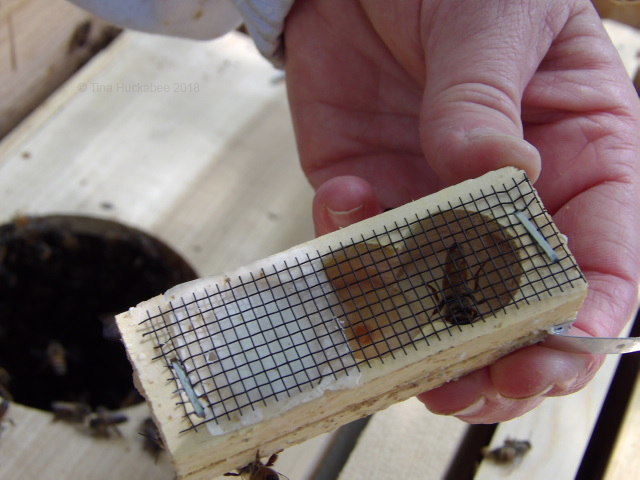 There are lots of things in your post about keeping bees that are new to me. I hope Buzz continues to prosper. It’s been a good beekeeping year, so far. I really only want 2 hives, but my original one, Scar, just keeps going on and on and on. Sorry you gave up beekeeping. It is a commitment of time, roughly 2 times/month checking. Pulling off honey is the most labor intensive thing we do, though. Fascinating. My husband has been given a hive but we’re undecided about actually stocking it, not least because neither of us are very fond of honey. Ah, yes; that’s the point really. I think I would be giving a lot away. A jar of backyard honey is a lovely gift. Wonderful post and photos. 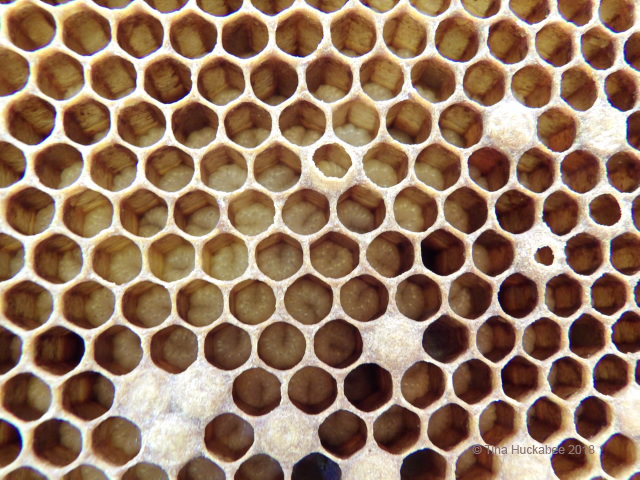 I am not a beekeeper but am fascinated by the process. Manuka honey restored my skin when I had a bad case of venous eczema last year and I am very grateful to the bees. Thanks, Robin. That’s interesting about the Manuka honey. Love it, or not, honey is remarkable stuff! Your posts on bees are so interesting. I will probably never have a hive, but I like seeing how it’s done. I’m pleased you’re enjoying the posts. We’re always learning something new! 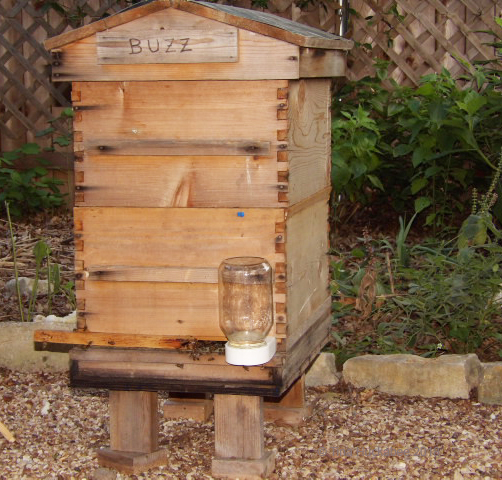 What an interesting description of the process of establishing a new hive – thank you for sharing that! You’re welcome–glad you enjoyed reading about it! Tina the photos are magnificent. The fascinating blog. I have learned many things and I am very glad that Buzz is again inhabited and with his queen and all is well. It’s amazing Woody’s cross comb. Everything is wonderful, I love it. Thank you very much for showing the whole process of riding a hive, I learned a lot. Have a nice weekend. Greetings from Margarita. Thank you, Margarita. We are very glad to have Buzz re-hived and full of bees! Oh my gosh, I learned so much from this post, Tina! I think it’s so wonderful that you’re still learning, too, even though you’re an expert at this point. Thanks for sharing all the info–I’ll never keep bees, but I find everything about them–all species–fascinating. I always read your bee posts word-for-word. I’m glad both hives are doing well at this point, and I’ll look forward to coverage about the “whys” of cross-combing. I chuckled when I read “expert”–trust me, we are still learning! The thing about beekeeping (as with all things complex, I suppose–you know, like gardening! ), one never really knows everything. There’s always some facet or event that is new and that the keeper needs to evaluate toward a solution. I agree with you though, all bees are fascinating! Oh, wow, Tina. You possess so much knowledge. Wonderful and beneficial project that will be enjoyed for years to come. Very impressive. I’m still learning and the honeybees seem to delight in throwing us curve balls on a regular basis. We have enjoyed this hobby though and I can’t imagine having a garden without at least one hive. They are so fancy nowadays. Perhaps the old ones were just as fancy, but do not look like it when they get old. 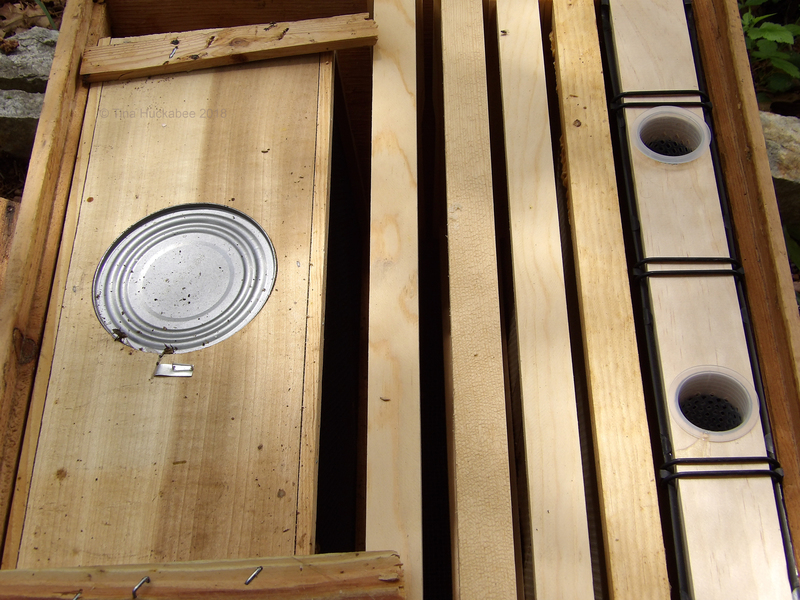 The Langstroth hives are the industry standard and for good reason–they’re very easy to work with. 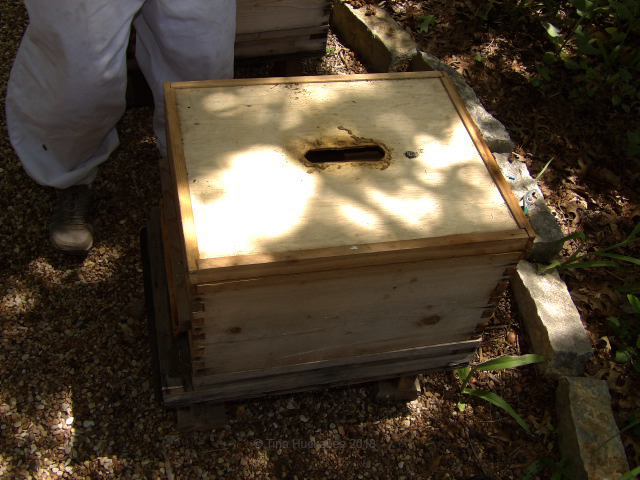 Our third hive, Scar, is a Warre hive which is an old-fashioned type. It’s very hard to get in and check on the girls. Fascinating post. I am so impressed by your bare hand approach. I used to keep bees but I never lost my fear of them. And they seemed to know it. Trust me, I do use gloves! The bees aren’t aggressive at this stage as they have no brood or honey to protect. But you’re right–they seem to “smell” fear. I’ve noticed that as soon as I become a bit uncomfortable or anxious, they sense my fear and, well, you know what happens then! Such a fascinating science, of which I have so much to learn. Thanks for the tour of a new hive! There’s a lot to learn about honeybees. For all that, we know even less about most of the native bees, which are just as complex and interesting. Indeed. There are such amazing variety. The more I learn, the more humble I become. Humble, yes! And also, appreciative of the role they play in the Earth’s survival. Good work! You deserve kudos for following a hobby with such great environmental and social value. Thanks, Jason. I wish they didn’t sting…. Wow Tina, you are so dedicated to your ‘bee work’, and there is a lot to do. They surely deserve it! The hardest part of the bee work is when we get honey. 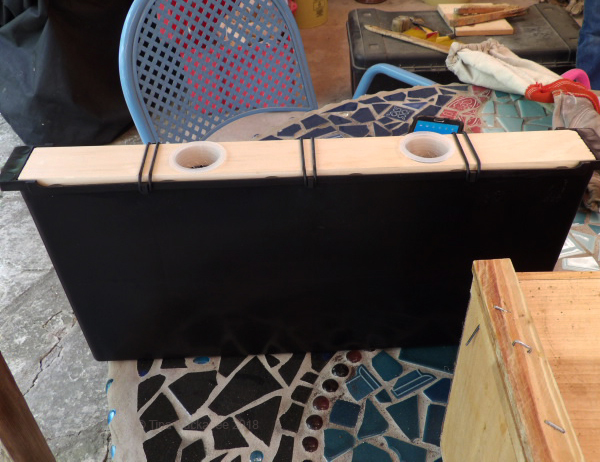 We don’t have an extractor and it wouldn’t work with our productive hive, the Warre hive. The twice/month checks are not that burdensome. Of all the details that fascinated me, the queen eating her way to freedom (so to speak) ranks right up there. After all you went through last year with Buzz, I’m glad that things are going well. And I’m glad there was a good solution for caring for them while you were away. There are so many details involved in keeping a healthy hive — I still haven’t entirely figured out the bees’ lives, but I really do love reading about them. Bee biology is complicated and there seems to be something new to learn all the time. They keep us on our toes! I learned about bee poo making comb go black, and now I have learned about an internal feeder. Nifty! The internal feeder was really useful, I’m glad we tried it.